In a country where the process of finding property has historically been more a pain than pleasure, the birth of meQasa three years ago was a welcome relief. Founded by three Ghanaian graduates from Meltwater Entrepreneurial School of Technology (MEST), the startup’s product – meQasa.com – currently features over 23,000 residential and commercial properties from across the country available for rent or purchase. This September, the company celebrates its third anniversary and revolutionising the real estate industry in Ghana. “It is most people’s absolute dream to own their own home. Businesses grow and need to move into better office space. Real estate is a huge investment. The journey to finding that perfect place should not be arduous. This gap is what spurred my co-founders and me to make a difference in the property search process,” explains meQasa CEO Kelvin Nyame, who started meQasa along with Kofi Amuasi and Rashid Seini in September of 2013. Today meQasa.com looks a lot different than it did in its infancy, not surprisingly. All three founders have a stellar tech background so the real estate portal is at an optimum state having seen a number of great innovations. Together they hired an outstanding team who have been the backbone of meQasa’s success. Aside from offering beautiful and user-friendly desktop and newly upgraded mobile interfaces, meQasa has become well-respected as the market leader in the online real estate space in Ghana thanks to consistent offering of resources like their blog and the DREAM HOMES newsletter, both of which provide housing deals as well as home decor and improvement tips. Earlier this year the company published The Accra Housing Guide. Over the past three years, meQasa.com hasn’t only been a saving grace to seekers who can peruse and review properties from anywhere, it has also been a source of business to hundreds of real estate brokers, agencies and developers. “meQasa has been the best platform in finding good leads for our business,” says Prince Twum of Home Rent real estate agency about his experience since listing to meQasa.com. Though the startup had been around for 2 years, it was after securing a breaking news $500K in funding from Malaysian investor Frontier Digital Ventures last year that the company scaled to take its operations to the next level. As part of its third year anniversary dubbed #meQasaAt3, the company has an upcoming soiree, is planning a training event for industry professionals and is sharing these interesting anniversary Facts & Figures with startup enthusiasts. After offering a platform to list property at no cost for years, meQasa has now made available to real estate agents and developers a better means of highlighting their businesses and available properties above non-paying portal users. This is just the beginning for the Ghanaian-founded company that is making waves in real estate in Ghana. What can we expect of meQasa at the 5-year mark? “We’ll continue to invest in the tools (mobile and web) that’ll help improve the experience for our customers and users. House hunters will also have a lot more property options to pick their dream home because we plan to scale up our listings to cover the entire country with keen focus on quality,” Kelvin Nyame says. meQasa.com is Ghana’s easiest way to rent, buy and sell property, offering a user-friendly online marketplace mutually beneficial to homeowners/landlords, home seekers, real estate agents and developers alike. 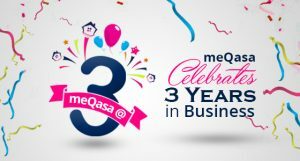 Witness The Level Up; meqasa Is Five Years Old!